This recipe occurred semi-accidentally. I was studying various thai recipes and examining the flavors, and went home to stare at my fridge, and out came this recipe. You can use the base rice recipe here, or you can use the Mango-Ginger Coconut Rice recipe I have posted. Heat oil in saucepan, sauté shrimp with shallots, garlic, and basil. Add thai chile and saute another 1-2 minutes. Add red pepper and pineapple, and saute until crisp-tender, and remaining seasonings. Mix with rice, and adjust seasonings as necessary. Garnish with cilantro. *note: A wonderful condiment to eat with this dish, and many other asian dishes, is Sambal Oelek, a garlic-chili paste you can find in the asian section of most groceries and asian specialty stores. It’s quite spicy, and quite tasty. Melt butter in a 2-3 quart saucepan over medium high heat. Add coconut milk, water, ginger, rice and salt and bring to a boil. Reduce heat to low and simmer, covered, for 20 minutes, then remove from heat. Fluff with fork. This recipe is a variation on one I found from Paula Deen. Basically, I’ve added ginger to the recipe, and adjusted measurements. At times, I’ll press a clove of garlic and add it in at the same time as the ginger. 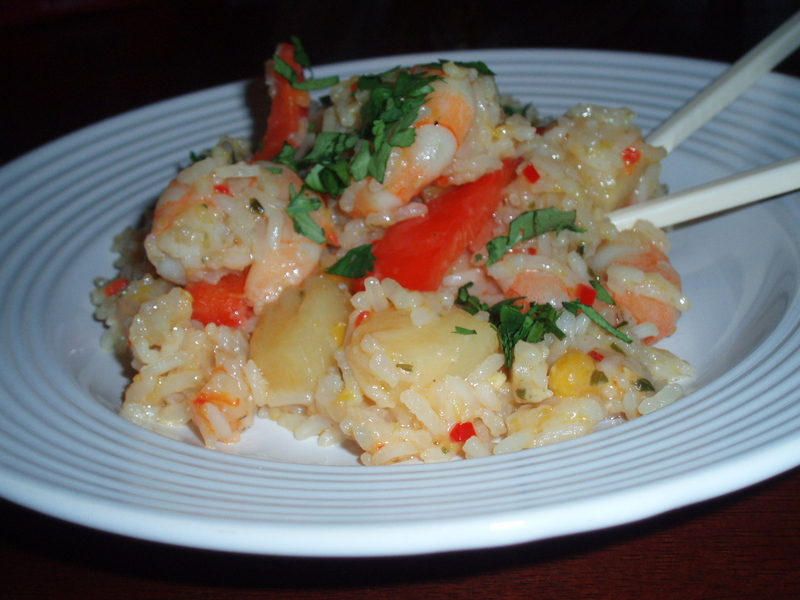 It’s easy and quite tasty as a side dish for stir-fry, or as the base of the rice for my Thai Rice Salad. In large saucepan, heat oil over medium heat. Add rice and stir to coat with oil. Add coconut milk, water, ginger and salt. Bring to boil, stir in mango. Reduce to low, cover, and simmer 20 minutes. Fluff with fork.